Wisdom of Life. 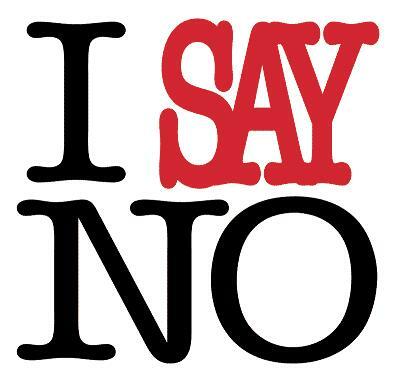 : Learn to say "NO" !!! To say 'NO' isn't easy, especially when a friend is trying to borrow from you. It took me years to learn not to let money to friends. In fact i had lost many good friends or even clients who had borrowed from me. Being soft hearted with a loose ear, i used to give out cash to those who seemed to be in trouble. Most who could not repay due to many reasons unexplainable, would never come back to me. The worst off was, they totally avoided me by the distance because they felt shameful and afraid to see me again. One of the reason they didn't take the initiative to return the borrowings was they took good friend for granted. So finally i lost all those friends whom i had helped wrongly in the first place. With so much lessons learned by the hard ways, i have developed a method to counter this problem. Each time when i am being approached again for letting out money, i would ask for one good reason why i should help them. Is better to listen for just the One reason, rather than to listen all the unnecessary problems of theirs, which might not be true in the beginning. I would try my best to listen and to understand. The only reason i could assist them is when they needed money for food, especially when a friend has lost almost everything and the family has no means to survive for the next one month or so. Otherwise, firmly and surely i would say 'NO' to them politely. Perhaps they might be unhappy and saddened with my unexpected reply but deep down in my heart i know by helping them is like loosing them as friends forever. This is one experience of life, i had to learn the hard way. Is easy to say 'YES' and its so difficult to say 'NO'.